I happen to have a three and a half year old daughter who LOVES to play dress up. She will wear my shoes, steal my purses and get into my makeup. She has drawn on her face with markers (thinking that it is makeup) and has coated her hands, face and arms with lotion. Anything that she can do to make herself look and smell like mommy, she will do. This is one of the reasons that I love having a girl. They are so different from boys and I love the girly things that she does! My daughter is truly a girly girl and I love giving her things that help her with imagination and dress up. 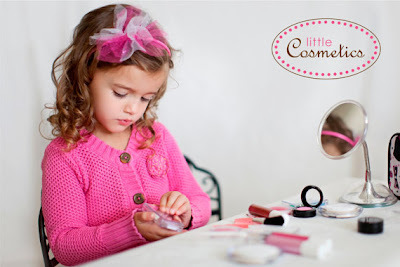 Little Cosmetics was created by a mother and school teacher. “As a mother of a toddler girl, I know first hand how much little girls love to play with make-up. My daughter would love to play with my eye shadows and powders, but it would always end up in a big mess. And I would also worry about the effects of having toxins absorbed into her skin. So I started shopping around for pretend make-up. I found two types of pretend make-up on the market: hard, plastic, unrealistic looking pretend makeup, or play make-up that made just as much mess as my own make-up! So I decided to create play make-up and Little Cosmetics was born. If your daughter is anything like mine, she won’t easily be fooled by pretend make-up. So I spent a lot of time creating products that look and feel realistic. I’ve seen girls as old as nine enjoy Little Cosmetics, and I've seen adults fooled into thinking Little Cosmetics is real make-up. I hope your little girl enjoys Little Cosmetics as much as mine." No one understands little girls like their mommies, which is why I love this company. I tend to enjoy working with mom-founded companies because they seem to just know what will make the best product to keep your little ones busy. My daughter needs things like this to keep her occupied and believe me...it helps me keep my sanity when she is busy! If this won't make a little girl feel like a grown-up, I don't know what will! I love how the eye shadow palette includes a special brush and the colors are so pretty! When I "tried" the Lip Gloss, I rubbed it on my lips waiting for liquid to come out. The little ball in the tip turned and turned but nothing came out. It seriously took me a minute to realize that it had nothing in it. That is what makes this cosmetic set so amazing. Your girl gets all the benefits of using makeup without the mess. I also think that the glitter shadow pot is very pretty. My daughter loves sparkly things and so this was a great item to include in The Essential Set. "It takes alot of concentration to do this, mom!" As you can see, Hannah loved playing with her new cosmetic set. We had a bit of trouble keeping her little brother away from it as he wanted to play too. Ha ha! My only complaint is that some of the containers are very difficult for her to open. I even had a hard time with the eye palette box...that was a toughie! Once we did get them open, she had a blast! The Essential Set would make an idea gift for any little girl in your life. The cosmetics are so pretty and they really do look real! This set retails for $20 and you can purchase it directly from Little Cosmetics Etsy Shop. Along with this set, there are other from which you can choose. You can also choose what color powder you want for the Pressed Powder Compact, which is great. So, in my opinion...Little Cosmetics is an adorable company. I love that it is owned and operated by a mom and that all the products are free and clear of toxins and glass. You have no need to worry about messes, stains or chemicals going onto your little girl's skin, which is fantastic. I would highly recommend this company to anyone looking for the perfect gift for a special girl. My daughter approves...and so will yours! Disclaimer: I received no monetary compensation for this post. I did receive free Little Cosmetics products for review purposes. All quotes and stock photos are from the Little Cosmetics. website and email. Prize is being provided and shipped by the sponsor. All thoughts and opinions are 100% mine. 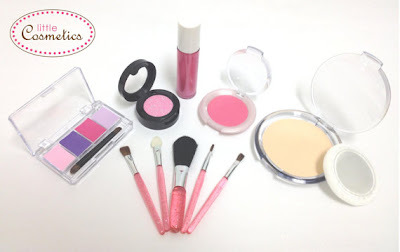 My daughter would love the The Ultimate Set - Little Cosmetics Pretend Play Makeup! I like the Ultimate Set! I would love to gift this to my niece, who is 2. She is always into mommy's makeup. I would get her the ultimate set! The Ultimate Set. Especially the Pressed Powder Compact. my daughter would just love this, it would keep her out of my makeup and prevent messes! I'm a Grammy that would love to have this waiting for my grand daughter next time she visits. Besides that it's just very well thought out. I would love for my nice to be able to try The Ultimate Set!!! My daughter would love the Ultimate Set as there are so many colors to choose from.